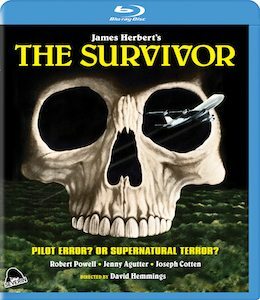 When a 747 crash lands in a Sydney suburb – a still-spectacular sequence that helped make this the most expensive Australian film of its time – the inferno kills everyone on board except the pilot (Robert Powell of JESUS OF NAZARETH and TOMMY) who emerges from the wreckage miraculously unscathed. But as a local psychic (Jenny Agutter of AN AMERICAN WEREWOLF IN LONDON) begins to communicate with the spirits of the doomed passengers, it will unlock a nightmare of madness, murder and supernatural horror. Hollywood legend Joseph Cotten – in his final film performance – co-stars in this shocker directed by British film icon David Hemmings (BLOW-UP, DEEP RED) and produced by Ozploitation maverick Antony I. Ginnane(THIRST, PATRICK, TURKEY SHOOT), featuring haunting cinematography by Academy Award® winner John Seale (THE ENGLISH PATIENT, MAD MAX: FURY ROAD) and now transferred in 2k HD for the first time ever. Posted in Catalogue and tagged 2017.